The spirit of Summer conveyed in organic and botanical works. Paper cut outs, photographs, mobiles, prints and ceramics celebrate this flourishing season. One Kiss contains a collection of Diva moths hand cut from images of vintage French chanteuses from the 1940's and 1950's from sheet music, alongside Beloved Underwing moths cut from vintage love song scores. In Cities of the World, atlases and maps of international cities depict different specimens. Encased in entomology boxes, Tracey Bush not only preserves the butterflies and moths but also the materials with which they are made from. Paper maps may soon cease to exist, as many of these butterflies. These collections hope to highlight their frailty and diversity, as an alternative to a collection of actual specimens. Tracey lives in the UK and her works are included in collections such as The Tate Gallery Library, The British Library (Handling Collection), The Museum of London, The British Land Company and The Yale Centre for British Art, amongst others. Sinje Dillenkofer's photography analyses and reveals social structures, values and images of nature. Questions of individuality and authenticity, and their reproducibility are posed through photo-sequences, serial photography, and typological studies. BY NATURE consists of 72 illustrations from the first female entomological pioneer Maria Sibylle Merian (1647–1717) based on her scientific research about the metamorphosis of butterflies on plants and flowers in Surinam. Her 1726 hand-coloured etchings - marked by precise observation, imagination and skillful depiction - have bled through the pages of the book onto their back and become double-page spreads. Sinje has photographed these and transferred them onto Japanese paper as 36 stunning diptychs inserting them in the context of contemporary art. Sinje's works are included in many museum collections in Germany and in the V&A in London. 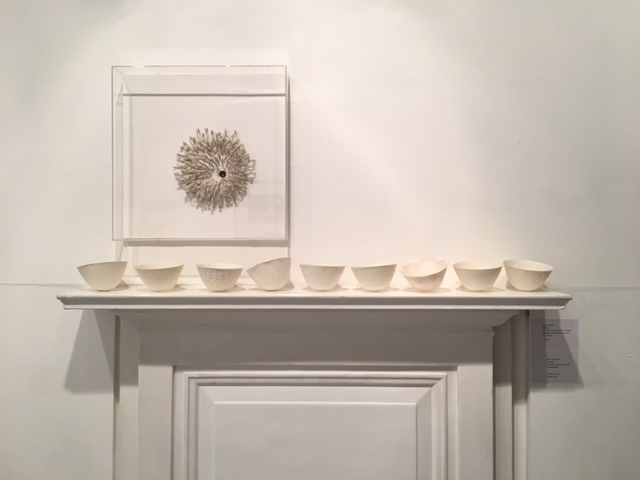 Almost paper-like, Alison Gautrey’s porcelain vessels in subtle shades of white are luminously translucent. These weightless bowls capture the feeling of movement within the simplicity of form. Alison has recently been experimenting with combining bone china and porcelain together in the same piece, exploiting the inevitable distortions that occur. A splash of white or a fingerprint indent, all render each vessel unique. In these sculptural pieces, Alison successfully combines certain randomness in the porcelain process with an intuitive vision through her design background paired with her knowledge of material. Alison obtained a BA Honours in 3 Dimensional Design – Ceramics and Glass at Buckingham College of Higher Education. A Dule of Doves, Juliet and Jamie Gutch's new white mobiles, appear to be soaring, flying or falling. The white works are ethereal and their contrasting shadows give life to rhythmic choreographies on the wall. Each one is created from different undulating leaves of wood. The outlined forms, like calligraphy, falling feathers or musical notes are all in perfect balance, glancing past each other, always intending to, but never touching. Juliet and Jamie were commissioned a large-scale installation for John Lewis at Westfield Stratford City, East London. They have also created "A Murmuration of Starlings", for the reception atrium of the Northumbria Specialist Emergency Care Hospital. Charlotte Hodes’s female signature figure moves comfortably across a series of vases installed in the gallery’s window. With a touch of humour, lightness and freshness, Charlotte appropriates every media with confidence, whether they are paintings, ceramics, prints, works on paper or glass. Her narrative is unique, drawing upon the decorative and applied arts, fashion and costume, often using archives and collections as a source for projects. Her current show at the Wolverhampton Art Gallery features an ambitious, twelve metres ceramic frieze specially commissioned with 120 individual plates as an alternative canvas that demonstrates her playful yet challenging approach to the aesthetic potential of domestic objects, both past and present. 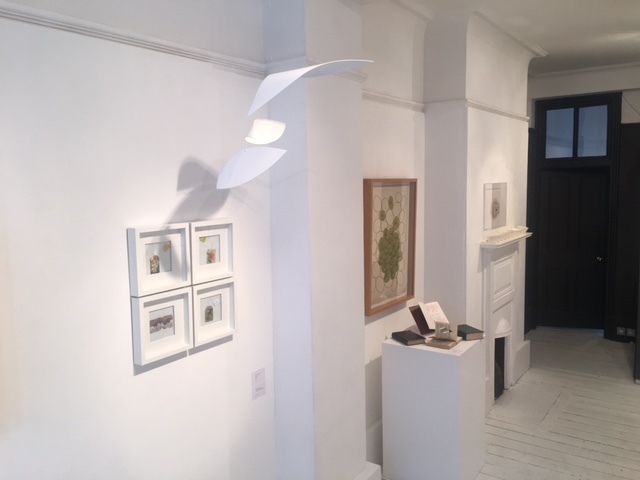 The exhibition is on until 3 September. Katherine Jones’s collographs and etchings often depict the recurring motif of a house, in a natural environment. 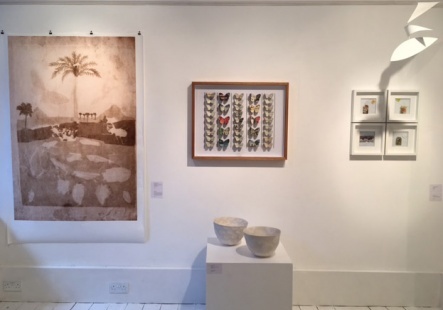 In 2015 Katherine embarked on a Residence at Eton College where she created Looking In, Looking Out, a portfolio of 16 prints that conveyed the beautiful and perfectly maintained college grounds. The other part of the portfolio was finished in the Tulse Hill Estate in South East London. “After the residency was completed I wanted in a small way to redress the balance by making a portfolio describing the Tulse Hill Estate in exactly the same way as I had the much depicted Eton 'estate'. As far as possible with Tulse Hill, I have tried to find equivalents to the places I had made the initial 16 prints at Eton. For instance, the nearest equivalent to the Eton 'Chapel', a neon cross on a building now used jointly as nursery and church”. Since completing her MA in printmaking at Camberwell College of Art, Katherine has been awarded several prizes and residencies including, Birgit Skiold Memorial Trust Award of Excellence, for The National Art Library V&A Whitechapel Artists Book Fair, Research Fellow at City and Guilds of London Art School, Pushing Print Award and the Northern Print Biennale Solution Group Prize Katherine’s prints are currently on show at the RA Summer Exhibition. Jeremy May transforms reclaimed books into unique pieces of jewellery carefully cut from the pages of the book. The layers of text and images are visible through the lacquered surface of each piece, which is nestled in the space in the book from whence it came. A 1935 Flower Book for the Pocket with colour illustrations by Charlotte Georgiana Trower and Ruth Weston encases a blood orange necklace shaped as a flower petal or bud. A fabulous geometric ring is secretly hidden in Four Fantastic Tales by Hugh Walpole. Jeremy trawls through book markets on his travels; each book chosen has a history; it was bought, read, written on, sold on or given as a gift. In time, it was passed on to a street vendor, a second hand bookshop, or offered to Jeremy. Often geometric in shape, the form and colour of each piece is inspired by a specific quote from each respective book. Stuart Redler shoots exclusively in black and white and prints himself. With an eye for detail and unexpected perspectives, Stuart turns familiar views and objects into new and unseen images. Whether a landmark of London, or a detail of a building, his works become magical renderings. The intense contrasts of shades of black and white and his use of strong light give Redler’s photographs a stark and unique quality. Architectural features take on abstract forms. Buildings become landscapes of pattern and composition. 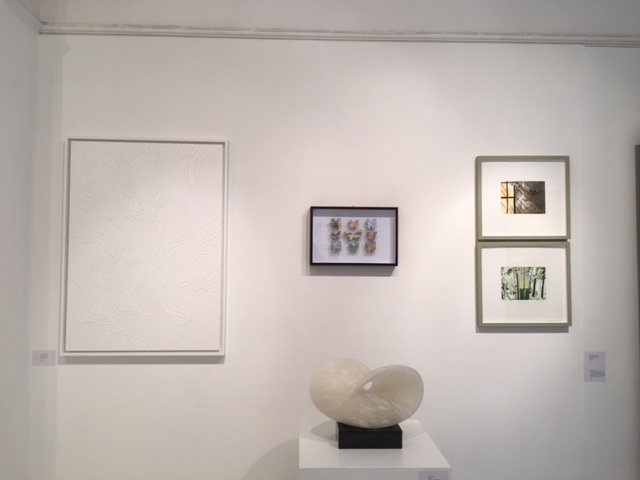 In his Botanical series, close ups of plants and flowers give life to sculptural shapes and texture. He often uses hard directional sunlight or flash in order to gain stark, high-contrast images. He has received many awards, including six from the Association of Photographers, who awarded him a Gold Medal in 2000 for his portfolio of Architectural Images. He has also received Graphis, PDN New York and Communication Arts Awards, amongst others. Stuart was born in Somerset and studied economics until attending LCP in London to study for a Photography Degree. As well as appearing in various private collections, his work is included in the permanent collection at the National Portrait Gallery in London and has been exhibited at the V&A Victoria and Albert Museum, London. Rachel Shaw Ashton hand cuts figures and forms from watercolour paper that is spray-painted. White, black or grey on white, each separate piece of meticulously cut paper is grouped together to form a stunning three-dimensional piece. Shadows between and behind each paper form create a dramatic tension. Despite the intensely laborious process of cutting each shape by hand, Rachel’s works have a fluid energy. Some works are calm; others are frenzied as the separate cuttings sweep up into one greater scenario. In some works, Rachel conveys a sense of realisation through the stirring of movement and in others a feeling of things being static and resigned. “I like to show figures in unusual poses caught in a split second of time. For example bodies flying or jumping representing freedom of spirit, joy or fearlessness and in contrast, I also like static figures that hopefully convey clarity, calmness, a coming to terms – whatever they invoke in the viewer.” Rachel studied Illustration at Brighton Art School. She spent many years as an illustrator and subsequently concentrated on fine art. She has been represented by jaggedart since 2009. Antonia Spowers works in a myriad of materials and styles exploring the different physical properties of materials, be it metal, glass or paper, and the way in which they can embody and suggest ideas. The varied aspects of water have been the focus including its structure, behaviour, altered states and multiple associations. 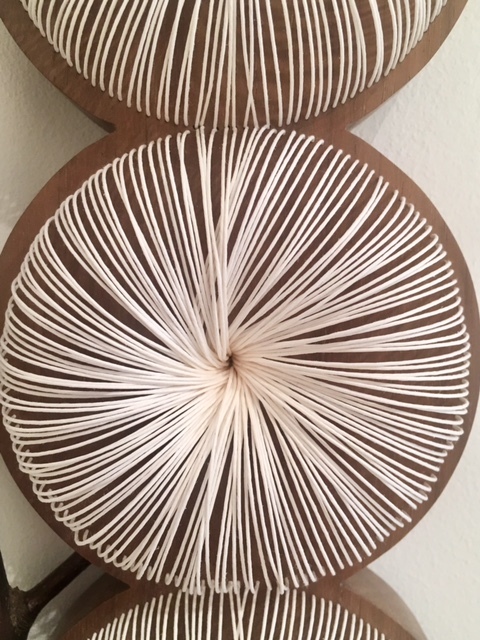 Her new paper piece is inspired by the flow of water. Water in fact led her to work with paper as it is formed in and by water itself. Paper is an extremely flexible medium for suggesting ideas of movement. The paper in Flow is not treated or dyed but worked with diluted PVA, which is used both as a glue and stiffener and is also water resistant. It strengthens the paper to a strong degree so that it appears to revert to its parent substance of wood. The construction and large scale of her paper sculptures evoke feelings of buried layers in the landscape and the re-cycled patterns of energy from the past. Antonia lives and works in Wales. 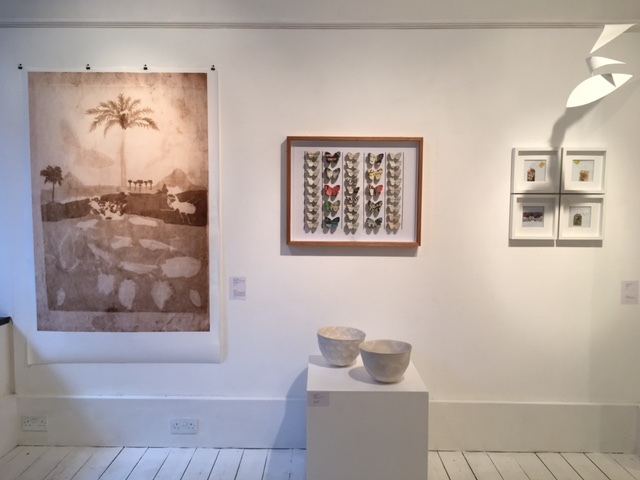 Patricia Swannell’s prints and abstract watercolours are inspired by the beauty of nature and the dark threats to the natural world. Willow branches, leaves and grasses are used on the printing press so that the paper becomes embossed with their shapes and textures, transforming flotsam and jetsam into poetic works of resonance. Colour Notes have been inspired by three historical women artists who made quiet but groundbreaking work. 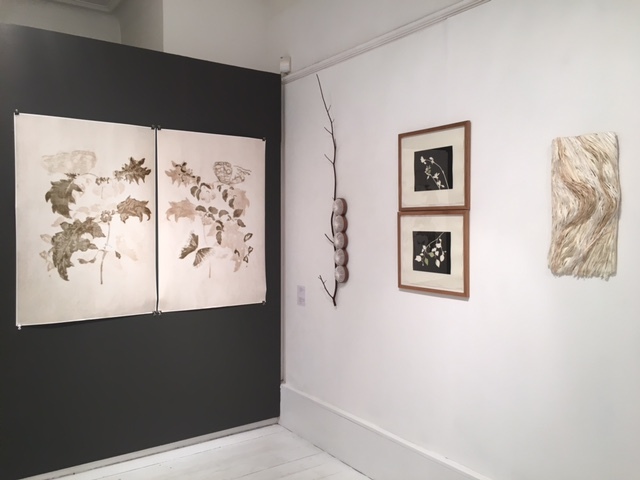 Maria Merian (1647-1717), Mary Delany (1700 -1788) and Marianne North (1830 -1890) created bodies of botanical works which today are recognised as innovative breakthroughs – in sensitive, accurate environmental observations and the use of unconventional, but expressive materials. Thinking of these women, Patricia uses the circle as a symbol and a motif, defining what is within, what is outside and what has been breached. The circle becomes a 'spotlight' for the careful dry brush illustrations juxtaposed against a matt black background. The series is a sort of meditation on these extraordinary women, innovators in their time, working within restrictive social conventions. Canadian born, Patricia lives and works in London. She completed a MA in Fine Art at City and Guilds with Distinction. Her focus on environmental matters is also reflected in her work for The Royal Botanic Garden Kew at Wakehurst Place and in her photography and print project Legacy, which records the growth of woodland in Leicestershire over the next six decades. Ruby Silvious is an American visual artist and graphic designer. Her recent work includes experimenting on recycled and found materials. In 2015 she started a project called 363 Days of Tea, a visual daily record of her impression of the moment, using the emptied-out tea bag as her canvas, and altering it to create a new work of art every day for 363 days. She draws, paints, prints and collages moody, evocative and sometimes whimsical art on used teabag paper. She is the author of a newly published coffee table book, 363 Days of Tea: A Visual Journal on Used Teabags. Silvious was educated in the U.S., Europe and Asia; she currently lives in Coxsackie, New York. Her art is exhibited internationally, and is featured in public and private collections. Rinkaku (Outline) continues Kazuhito Takadoi’s interest in organic works combining the formality of Eastern discipline with abstraction from Western art. Kazuhito sows blades of green grass hand picked from his garden or allotment onto Japanese paper. 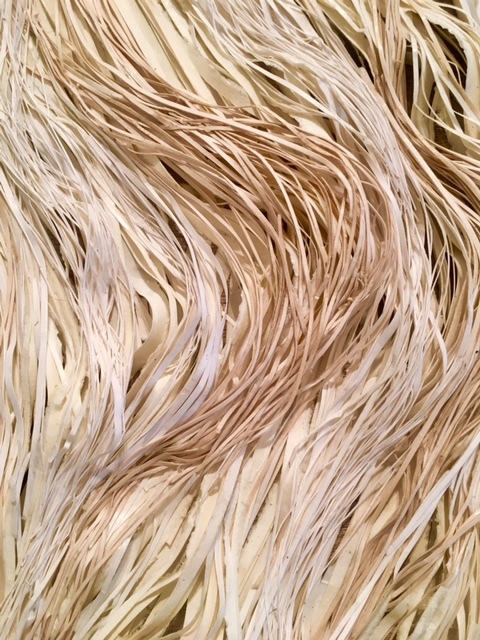 In this work, pure white Japanese book binding threads are dyed with traditional Sumi ink and then the string is sewn to the washi with grass to form the outlines. As the grasses dry and mature they embark on a subtle colour shift, comparative to seasonal change, which will further contrast the black ink and gold leaf on the background. Kazuhito’s exquisite works are full of dichotomies: his work is both minimal, yet opulent. It is simultaneously fragile yet has strength. Kazuhito Takadoi’s interest in shadows is an important dimension to his grass, wood and twig sculptures, “As the light changes or the point of view is moved, so the shadows will create a new perspective.” Kazuhito trained in Agriculture and Horticulture in Japan the US and in the UK, before studying Art and Garden Design in the UK. His works are in important private and corporate art collections. Aurélie Wozniak presents a paper relief, engraving its surface into streaks of cottony frost. Time and thoroughness are key to her works. Her craftsmanship and imagination give way to organic and dreamlike formations. Landscapes of forms are shaped on the paper surface with furrows creating geological abstractions. Plant is both inspired by the air and the network of sap, as an expression of lifeblood. In a trip to Australia where she encountered the underwater world and the desert, she found her inspiration and began her investigation of colour and materials. Aurélie works with wood, paper, metal pins allowing texture and tactile qualities to emerge from her work alluring the viewer into a luscious and colourful terrain. Aurélie is a Graduate of the Design Textile-Material-Surface of ESAA Duperré School. She lives and works between Paris and the Loiret. Thurle Wright works with a plethora of text materials, transforming atlases, books and dictionaries into complex paper works. She patiently folds, morphs, cuts and contorts her various paper sources, in order to distort and deconstruct their original meaning and purpose. In Flourish, sentences of Virgil's Georgics and an acorn, painted gold inside, are arranged to form a natural and organic shape. In contrast, Complexity, is formed by rigorous triangles extracted from pages of a book about the science of systems. She also frequently refers to maps and classical works of literature as her source material. 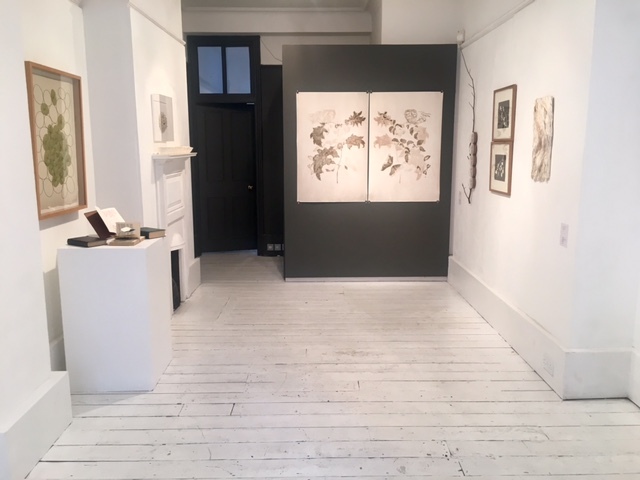 In their original form, by reading a map or a book, the reader is taken on a different type of journey, which is paralleled by the complex transformation that these materials go through as they become artworks. Thurle was born in Zimbabwe and now resides in Kent. 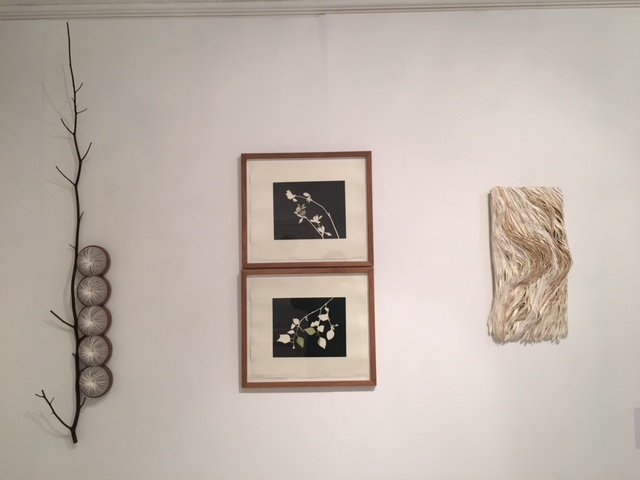 She initially studied modern languages and literature before specialising in visual art, and achieving a degree in Textiles from Goldsmiths College. Thurle has exhibited widely with galleries and art fairs across the UK, most notably at the V&A Museum of Childhood, Royal London Hospital and Canary Wharf. She has also showcased work abroad as far as Australia, California, Germany, Paris and Brussels.